YOU'RE A GOOD MAN, CHARLIE BROWN (REVISED) opened on Broadway in 1999. It is a fresh approach to the all-time 1967 classic. Sally Brown joins Charlie Brown, Linus, Lucy, Schroeder, and Snoopy in this version. Two new songs, Beethoven Day and My New Philosophy, have been added to the twelve wonderful numbers of the original version, such as My Blanket and Me, The Kite, The Baseball Game, Little Known Facts, Suppertime and Happiness. NOTE- Online sales end two hours prior to the show. Tickets are available at the door only after online sales end. Thank you for your order! You will receive a confirmation via e-mail shortly. If you have any questions regarding your order, please contact Mainstage Center for the Arts at 856-227-3091 or info@mainstage.org. Please reference the order number listed below in all correspondence. 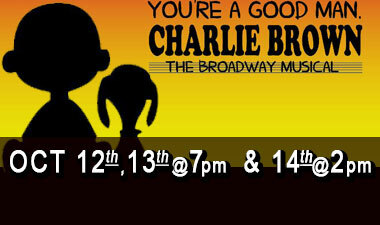 Man, Charlie Brown, a musical for all ages, October 12 -14 at Dennis Flyer Theater, Camden County College, Blackwood. This award-winning Broadway revival version brings Charles Schultz’s beloved characters to life. It follows one full day in the lives of Charlie Brown (John Koza of Mantua) and the “Peanuts” gang capturing classic moments such as Schroeder (Frank Testa of Blackwood) at the piano, Linus (Christian DeCola of Maple Shade) with his blanket, Lucy (Nicole Duffy of Williamstown) as a psychiatrist, Sally (Kaylee Corrato) frustrated with her teacher; and Snoopy (Brielle Hina of Sewell) waiting eagerly for supper. Filippo earned her degree in theatre from Rowan University in 2017. Joining her on the directing team is vocal director Lexi Scheiber. The production also includes a small ensemble featuring Charlie Bell Angelina Canavan, Carleigh Cusick, Shannon Enright, Isaiah Lee, Alison Maselek, Ryan McDermott, Ashleigh Neilio, Riane O’Donnell, Diana Pinolini, and Nadya Solometo. visit www.mainstage.org, or call (855) 936-2467, ext 3.